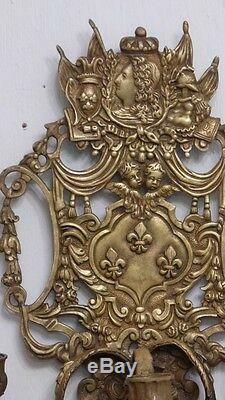 Pair of louis xiv style wall sconces. They illuminate with 3 lights carried by a mask. The platinum is richly adorned with royal attributes, fleurs-de-lis, cherubs, attributes of the war, and a pendant portrait of louis xiv and his wife, surely marie Therese of Austria. The set was pierced for electricity, a branch soldered to tin. Delivery 18 euros in France, 35 euros in Europe and 60 euros rest of the world. Width: 26 cm height: 33 cm. Put your items on sale quickly and easily, and manage your ads in progress. 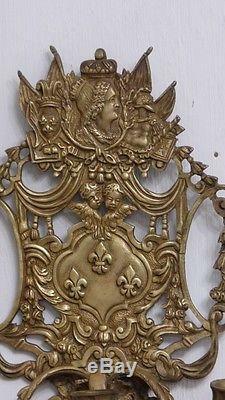 The item "pair of bronze sconces, louis xiv style, royal attributes, nineteenth time" is on sale since Wednesday, March 22, 2017. 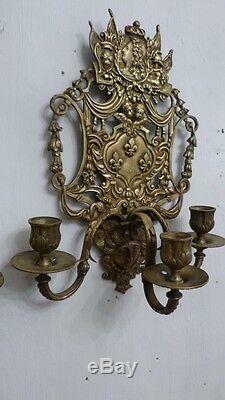 It is in the category "art, antiques \ furniture, decoration xix \ lighting, lamps ". The seller is "legrenierdaugustine" and is located in / in cognac forest.